For most people, waking up early in the morning to run seems like another chore. You probably work out not because you want to, but rather because you have to. The thought of keeping fit and finally having your desired body keeps you going each morning. What if I told you that there are fitness focused devices that will help you get a clearer picture of your health, without necessarily overhauling your daily routine? FitBit is the biggest name in the game and their fitness trackers are already hot sellers. There are various FitBit smartwatches and trackers ranging in design, features and price to suit every need, taste and budget. Getting in shape has never been so easy. These devices let you monitor your progress by recording your workout and sleeping patterns. Every athlete should include a Fitbit device in their shopping lists. To give you the ultimate experience, the FitBit fitness trackers need to be paired with different accessories. Accessories that perform different functions to ensure everything is in the right place. These can include screen protectors, additional charging options and replacement cords. Many new owners of FitBit devices have no idea where or how to get the best compatible accessories. For the where, Amazon is the worlds’ largest online marketplace that has virtually any product you could think of. Fitbit may offer replacement bands for their products, but besides being pricey, they have limited designs. We searched the internet and consulted FitBit users on some of the best available accessories from third party manufacturers. We present to you the best FitBit Accessories in 2019. Fashion wasn’t left behind when designing this wrist strap. The HopCentury Wrist Strap comes in loads of colors and looks with a conventional design. The wrist strap is made of silicon material which is not only soft and comfortable, but also safe to wear at all times. You can comfortably wear it when you’re taking a shower or on rainy days as it is fully waterproof. The strap is adjustable, and you will be surprised by how many wrists one size can fit in. The manufacturer’s goal is to satisfy the unique needs of their customers and address any concerns they might have. In order to achieve this, HopCentury offers a one year warranty and a 30-day money guarantee on defections. The Step Counter for use with Garmin & Fitbit Ankle Strap Ankle Band! Wear with Fitbit Flex 1/2, Fitbit One, Fitbit Alta/HR, Fitbit Charge HR 2, or Garmin Vivofit 1/2/3/JR. PROTECTION- Our new patent pending design features a reinforced snapped pocket and sturdy snap around ankle design to prevent loosing your tracker! COMFORT- No more chaffing silicone again your delicate skin. We use soft premium neoprene! ADAPTABLE TO FIT ANY LIFESTYLE- Many of our customers are service members in uniform or hospital workers. This band keeps your tracker out of site and you in dress code compliance! NOW IN 3 SIZE OPTIONS- XS/Small fits 5 ½ to 7 ½ inch ankle circumference, Medium fits- 7 ½ to 10 ½, and Large/XL fits 9 to 13 ½. When the wrist isn’t good enough, the ankle will do. This band isn’t designed to be worn only on the wrist, but also the ankle. This is particularly helpful for the times when your arms aren’t moving, for instance when you’re in a pushchair, and so the tracking won’t be accurate. It comes with an overlapping pocket to insert the FitBit. 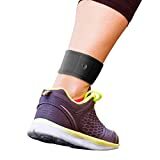 Most users prefer using this ankle band when cycling and save the wrist for a normal watch. The band is comfortable and secure, made out of a material that is soft and non-scratchy. Also, the band comes in three sizes suitable for both children and adults, a feature highly praised by the users. Cleaning it is simple – hand wash it and leave it to air dry. The Step Counter Ankle Band stands out from the rest of the bands in our list as it is the only one worn on the ankle. Stylish Metal Milanese Bands only fit for Fitbit Charge 2 hr heart rate (Tracker is NOT included). Small size bands fit for 5.5" - 8.5" wrist. 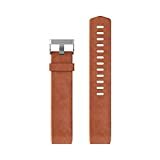 Strong magnetic clasp closure, easily stick and lock your watch band, allowing you choose the most comfortable size for yourself and holding your band securely. Durable stainless steel connectors lock the fitbit charge 2 securely, fit seamlessly into your Fitbit Charge 2 interface, very easy to install and remove. If you’re still rocking the Fitbit Charge, you are probably bored with the band that came with it in the box. For a sporty design and fashionable look, consider replacing it with the SWEES Metal Bands Compatible Fitbit Charge 2. It spruces up the look of your Charge 2 and at the same time assists in monitoring your health progress. 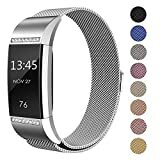 To ensure your wrist doesn’t get all hot or sweaty, the band comes in a breathable and ventilated design made of premium woven stainless steel metal. The band ships in a small size, fitting wrists of sizes 5.5”- 8.5”. The Milanese loop is easy to take on and off. With it also comes a strong metallic clasp closure that ensures a firm and secure grip. Its easy-to-install stainless steel connectors will lock your device securely, and fit into its interface seamlessly. The band comes with a 1 year warranty and is available in a ton of different finishes. 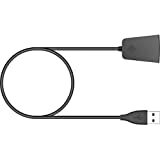 The FitBit Charge 2 Charging Cable is more than an accessory; it is a necessity. It comes in handy precisely when your FitBit Charge 2 is in low battery. The charging cable ensures your device is always full and you never have to be inconvenienced ever! What is impressive is its slim size that makes it easy to be packed in purses, backpacks, and pockets. Transporting and storing it isn’t an issue. It is compatible and plugs into any USB Port making it ideal for travels. You can keep alternatively keep a piece at the office until the need arises. With the FitBit Charge 2 Charging Cable, you will not have to worry about running out of power. For a dapper formal look when you’re planning to go out to a special event, you will want to consider the FitBit Charge 2 Accessory Leather Band. You, however, do not want to work out with the leather band. I would instead advise you to go for an alternative one like the silicone version. The leather band’s sleek and comfortable design makes it suitable for wearing during the day and night times. Different colors are available to cater to different tastes in people. They include pink, cognac and indigo. Its flexibility and durability will assure its services for a long time. The band is sweat, rain and waterproof, but not swim proof, a point worth noting. It is therefore recommended that you take it off when you’re out to take a swim. Also, showering with it isn’t a great idea, as it is best when dry and clean. For a FitBit accessory that converts a workout to a night out, the FitBit Charge 2 Accessory Leather Band scoops that award. It looks great and at the same time monitors your health. 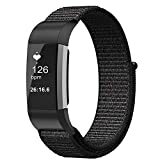 Compatibility: designed for Fitbit Charge 2 Heart Rate Smart Fitness Tracker. Breathable Woven Nylon: made from soft, breathable nylon weave material, ensure that no harm and provide soft cushioning on the skin which allow moisture to escape. It's durable, fashionable and breathes wonderfully. It's perfectly suitable for exercising, makes you feel comfortable no matter how long you with it. Adjustable Length: secure the band with an easily adjustable hook- and-loop fastener, the size of the band can be freely adjusted according to the circumstance of individual wrist, providing the best wearing experience. 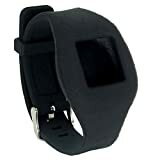 Fits wrist size 5.51" - 7.48" (140mm - 190mm). Replace Watch Band Easily: Band comes with watch Lugs on both ends, which locks onto your Charge 2 securely & tightly, fit seamlessly into your Fitbit Charge 2 interface, easy to assemble and remove, no tools needed. Package Contents: 1 x Fitbit Charge 2 Nylon Sport Loop Watch Strap (Note: the Fitness Tracker is Not Included). 1 Year Warranty - Replacement or full refund without return. Who said that you couldn’t be on budget and still enjoy cool FitBit accessories. The benefits you’ll get from the Fintie FitBit Charge 2 Nylon Band at a fraction of the fee will surprise. For those irritated or allergic to silicone or the metal steel found in most activity trackers, this accessory is the right match. It comes at a relatively low price and a variety of colors to choose from. The pink, blue and black band comes with a buckle and fitting it in shouldn’t be a problem. The Charge 2 Nylon Band provides cushioning to the skin. Its material is soft, breathable and harmless. Comfort is key when working out and you don’t have to be always worried about the condition of your arm. That’s not all. The band is stylish, sturdy and durable meaning that it will see you through numerous workouts. Also, its size is adjustable thanks to the hook and loop fastener. Finally, its purchase is secured with a one year warranty. You’ll either get a replacement or a full refund of your money if you’re not satisfied. If you were stuck in between options, you now have have an idea of what you will settle for. To find the right accessory, consider the following factors size, features, size of wristband, design, and style. The accessories might seem small in size but are significant in functions. Decide on your ideal accessory and check it out on Amazon for purchase.